A request arrived this week for permission to use a cartoon I’d created years ago, showing the gradual release of responsibility of model. As an inquiry teacher, who values learner agency, do you always teach or model first, only letting go when you think they are ready? Or are students free to have a go, explore, experiment, test theories, formulate ideas… while you observe the learning, allowing your observations to inform when and whom to teach or support and when to step aside? Do you trust the learners and the learning process? It’s exciting to see teachers adopting the idea of thoughtfully considered reflective questions for themselves, as well as for the learners, in continued pursuit of the goal of developing the whole child – and the whole teacher! – rather than simply focusing on curriculum content. If I want the children in my class to be creative, how might I encourage creative experimentation? How will I foster creative thinking and problem solving? If I want to develop writers who consider audience and purpose in their writing, how will I help them find opportunities to write for an authentic audience? If I think feedback is an important part of learning, how will I promote the giving and receiving of effective peer feedback? If I want learners to be empathetic and understand different perspectives, how will I ensure that all points of view are considered to help them develop empathy? If I want the next generation to make sustainable choices, how will I help them to understand the impact of their choices and to become thoughtful, principled global citizens? If I want them to care about their environment, how will I foster a genuine sense of shared responsibility? If I don’t want them to see mistakes as failure, how might I help learners use their struggles to develop resilience? If I want my students to be positive, active digital citizens, how can I provide authentic contexts to practise digital citizenship? And how will I help them understand that positive active citizenship applies online or off? In a recent collaborative planning session, while developing the notion of iTime (or Genius Hour) into an opportunity for self reflection and personal growth, the Year 6 team took this type of reflective questioning to another level! What do I notice about myself as a teacher? What skills and dispositions do I need to develop as a teacher…? How does learner agency influence the need for ‘classroom management’? Inspired by Nadia Ellis’ post, we explored the meaning of ‘management’ and compared our agency list with synonyms for ‘manage’ – control, handle, master, manipulate, dominate, rule, oversee, supervise… No wonder that little blue guy is pushing back! So how might we create a culture of learner agency in our classrooms, a culture in which learners are empowered to take ownership of their learning and the need for classroom ‘management’ is diminished? We’re exploring agency through the lens of Project Zero’s Eight Cultural Forces: language, time, opportunities, expectations, interactions, routines, modelling and physical environment. How might a thoughtful approach to each of these support the development of a culture of agency? What might we need to change? We’re compiling a collaborative list, so what are your thoughts? ‘Through their passions?’ someone asks. Taking a stance on an issue? Sharing experiences? These are some of the possibilities raised by the the group. They have all read blog posts, but not written any. I think back to eight years ago when I first started blogging. My first three posts, which I soon deleted, sounded as though they were written by different people, as I struggled to find a voice. It was only when I let go of preconceived ideas, stopped trying to impress an imagined audience and just wrote, that I found a voice… my own. It’s best not to over think or over plan. Try not to agonise over whether your writing is good enough. Write, check, publish, done. You can always write another post when you’ve developed your thinking further or changed your perspective. Just write. A lot. Or you will never find your voice. Teachers in the flow of writing their posts. About what? Where do I get my ideas from? Geeze….is this how I make the children feel when I say…”Just write about whatever you want” Do they freeze up like me? How am I meant to encourage children to be authors and find their voice, if I am unsure of how to find my own? I have never seen myself as a ‘writer’ but find such contention with this because I know how important it is, as a teacher, to model to the children, to show them different styles of writing, to show them what it might look like to take a leap and enter the world of being an author! Have I ever written something as an author? I really can’t say. I have recorded my opinion while listening to someone speak…Is that being an author? I have modelled story writing with the children in class…Is that being an author? I have written my reflection or opinion on things…Is that being an author? I write questions to my children in response to their learning…Is that being an author? Perhaps I am just a little unsure of what being an author ‘looks like’ or perhaps I just lack the confidence in my own skills to ‘have a go’. I encourage that ‘growth mindset’ with children everyday, yet haven’t been able to apply it in my own world. Why? If I really think about it, I am a writer everyday, I just don’t put my words in to writing. My younger sister recently had a career change from Lawyer to Transformational coach – what a huge leap of faith she took. And, while following this niggle has lead to great things, she has also come across road-blocks when it comes to writing and expressing her voice. Being new into the industry she feels her voice isn’t valued or worth something…yet! And although she has felt this way she has realised that it is the only way to share her feelings to have her voice heard and to inspire people…so she did it!! She writes blogs, facebook posts, reflections, coaching seminars, she uses anything she can to share her passion and her voice. She was terrified…she didn’t know how it would be received….but she did it! So……really I am just being a big wuss…look out blogging world, I am coming in hot! The children at Matt Glover‘s feet are unsurprisingly engrossed in the conversation. Matt is interesting and funny and he talks to them in an engaging and respectful way. This is the introduction to a lesson in which he models his approach, observed by teachers inquiring into how to improve the teaching of writing. What strikes me is that it’s not just about writing workshop. Good practice can be applied across all learning areas…. What if teachers kept all ‘lessons’ to 5 minutes? What if the learners were quickly released to get on with it? What if the majority of learning time involved learners engaged in doing? What if the teacher conferenced with individuals, not to correct, remind or tell, but to teach at point of need? What if strengths were noticed, named, shared and built upon? What if children were encouraged to see themselves as ‘insiders’ in the learning process? What if learners modelled their own creations on authentic examples from the real world? What if learners were encouraged to imagine and to innovate? What if learners were encouraged to be the teachers in the room? What if teachers trusted the learners and the process? What if learners had agency over their learning? What if successes were shared and celebrated? What if classrooms were always filled with ‘real’ learning rather than ‘doing school’? Should we focus on teaching or learning? “Inquiry happens when you focus on the art of teaching.” Kath Murdoch. This is an interesting moment in Kath’s conversation with teachers. I lose focus on my note-taking as I pursue this thought… I tend to say ‘focus less on teaching and more on learning’, and here is Kath Murdoch, inquiry guru, expressing what, on the face of it, seems to be just the opposite. 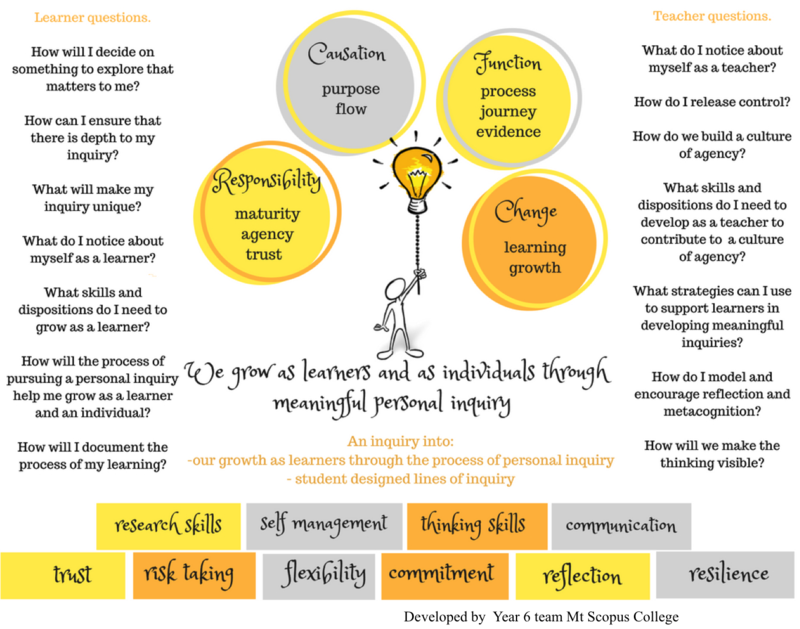 What does it mean to have an inquiry stance in our teaching? Language: Use a language of learning not compliance. Choose language that supports learners in describing and reflecting on their thinking and learning. Process: Focus as much on the process of learning as the content. Use split screen teaching. Notice and name how we are learning, not just what we are leaning. Release: Let go of your expectations and allow students to lead. Ensure the learners do the heavy lifting. Release responsibility as early as possible, then observe where to take the learning next. Teacher as learner: Position yourself as part of the learning community, not as the expert in the room, both physically and through your interactions. Make your own thinking process visible. Time: Do less, but do it more deeply. Devote time to developing learning dispositions. Give children time to reflect on how and why they change their ideas or thinking. And, in a moment of clarity, I see that Kath and I are talking about the same thing… The ‘art of teaching’ IS knowing how to focus on the learning.